Poor Terry Gilliam. Having seen his dream Don Quixote project get lost in La Mancha, he then struggled to get his vision for The Brothers Grimm on-screen. Tired of the shenanigans of producers and financiers he decided to make a small budget film of limited scope, that would leave him free to display his unfettered creative genius. This, the near-incomprehensible result, sadly calls into question whether he should have bothered. Tideland is a fairy tale of the Alice In Wonderland variety told in the melodramatic style of David Lynch’s Wild At Heart. 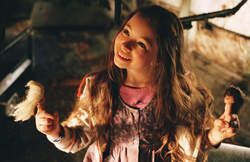 On paper this sounds great, but almost as soon as young Jeliza-Rose (Jodelle Ferland) discovers that her guardians Noah (Jeff Bridges) and Queen Gunhilda (Jennifer Tilly) have kicked the bucket, the film heads downhill faster than our young protagonist dives into a rabbit hole. It’s similar in tone and style to Rebecca, The Ballad of Jack and Rose Miller’s little known but far superior debut Angela (seek this film out on DVD if you can), but that is where comparisons to this stifling film end. Gilliam's plan to make a small budget film of limited scope that would leave him free to display his unfettered creative genius sounds good on paper. However, his melodramatic, Alice In Wonderland variety fairy tale is sadly near-incomprehensible, calling into question whether he should have bothered.